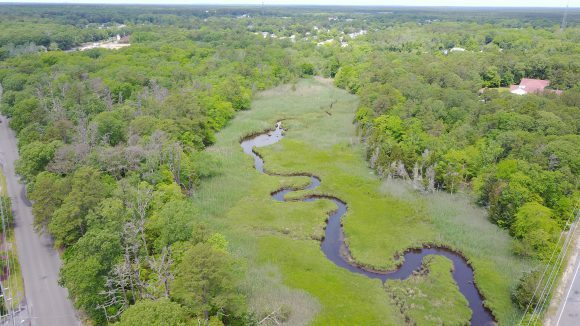 Share the post "Prof. Mike Kennish Highlights Rutgers Estuarine Research in his Role as Lead Guest Editor of Leading International Journal"
Aerial photo of the JCNERR brackish marsh that appears on the cover of the January 2018 issue of Estuaries and Coasts. Mike Kennish, professor in the Department of Marine and Coastal Sciences, served as the lead guest editor of the January special thematic issue of Estuaries and Coasts, considered the leading estuary and coastal journal in the world. The special issue, “The National Estuarine Research Reserve System: An Integrated Network of Research and Monitoring Sites Supporting Coastal Zone Management,” focuses on select research conducted in NOAA’s National Estuarine Research Reserve System (NERRS), a network of 29 estuary sites protecting more than 525,000 acres of estuarine and coastal habitat in the U.S.
Salt marsh research conducted in the Jacques Cousteau National Estuarine Research Reserve (JCNERR) in Tuckerton, New Jersey, is profiled in the special thematic issue. This high-impact research is a collaborative effort of Rutgers and JCNERR scientists. 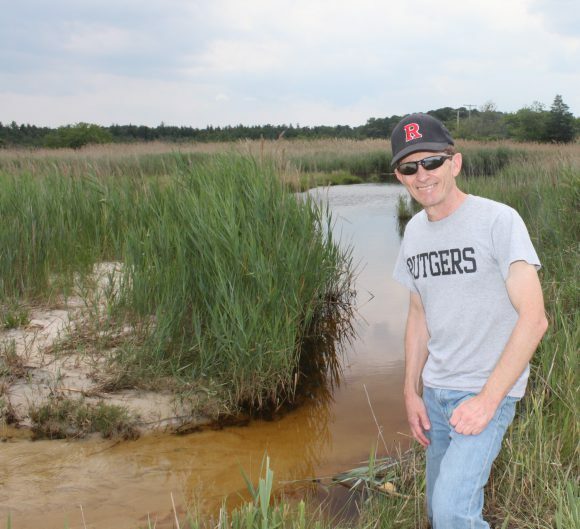 Rutgers New Jersey Agricultural Experiment Station manages the reserve, which includes more than 115,000 acres of forested uplands, wetlands, aquatic habitats and barrier islands. In 2015, Kennish served as the editor and a contributing author of the Encyclopedia of Estuaries, an international volume of the most comprehensive and multidisciplinary research knowledge and advances in estuarine science at the time. NERRS strives to enhance the management of estuarine resources by acting as a coordinated network for the detection and measurement of local, regional, and national trends in estuarine conditions. The mission of NERRS is to practice and promote stewardship of coasts and estuaries through innovative research, education, and training using a place-based system of protected areas. To obtain a copy of Estuaries and Coasts, Volume 41, Issue 1, visit https://link.springer.com/journal/12237.